Why did you decide to try the camp? – I originally saw bootcamp on Class Pass and jumped on the opportunity to work out outside! What is your favorite workout we do at bootcamp? – Tabata Tuesday! Is there an exercise we do in class that you have a love/hate relationship with? – I have a love/hate relationship with tricep/narrow pushups. I would like to think I’m getting better at them but I have some work to do. Have you lost weight, gotten faster or stronger and if so – can you tell us about it? – If anything I think I have gained weight in the form of muscle. I feel a lot stronger and doing high intensity intervals has helped with my stamina and distance running. What advice do you have for new girls starting camp? – Bring water! The first class is definitely the hardest, so don’t let that scare you away. I’ve found that over time I have been able to challenge myself more and push myself further. What keeps you motivated? – Feeling faster and stronger keeps me motivated. Once you start to see results/progress, you’re hooked. Also, Carrie yelling that summer is __ days away keeps me motivated! 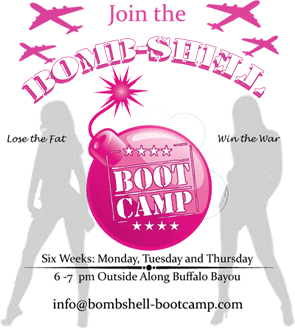 Would you recommend Bombshell Bootcamp to a friend? How would you describe the camp to them? – I would definitely recommend Bootcamp to my friends! I haven’t been able to convince them to come to the 8am Saturday class yet, but I’m working on it. Every class is different, so it keeps things exciting, and Bootcamp is so much better than going to the gym alone. It’s also motivating to have high energy instructors and the rest of the girls in the class with you. How would you describe the trainers: Cari & Carrie? Cari & Carrie are both awesome trainers! It’s obvious that they have a ton of fitness experience. They not only teach Bootcamp, but they provide us with health & fitness advice, recipes and extra workouts on our days off. They push me outside of my comfort zone, but in a good way. It’s obvious they have a genuine interest in all of our fitness goals. Tell us something fun or interesting about yourself that others at the camp may not know. – I have lived in 4 states in the last 4 years and have finally settled down in Texas as an engineer working in Oil & Gas with my chocolate lab, Finn!